Ciudad Colonial, colloquially known as “Zona Colonial” (Colonial Zone), is part of the original Santo Domingo de Guzmán, Dominican Republic, and the origin of the district dates back to the 1500s. The District is located in the west corner of the Ozama Rier, which bisects the city. The district today covers less than 5 square kilometers. It is an important section of the city due to the high number of landmarks, including Alcazar de Colón, Fortaleza Ozama, Catedral Primada de America, and others. The city was surrounded by a defense wall extending from the Ozama River to "La Puerta del Conde" (The Gate of the Count in Spanish), which was the only entrance to the hinterland and the furthest boundary of the city until around the late 19th century. The Spanish used this settlement as the first point of influence in the Americas and after that conquered much of the American mainland. Even though Spaniards focused their attention more on mainland cities after conquering Mexico, Cuba and other regions of Latin America, Ciudad Colonial remained an important historical site. 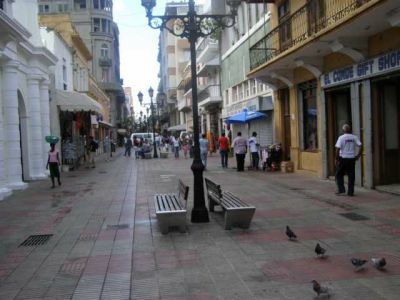 La zona Colonial es el nombre con que se conoce a la parte más antigua de la ciudad de Santo Domingo de Guzmán, capital de la República Dominicana y que fue la primera ciudad fundada por europeos en América. El nombre se debe a que esta parte de la ciudad fue fundada por los colonizadores españoles.